I just want to wish everybody a happy and safe Thanksgiving this year. Hope the day finds you all well and able to enjoy time with your loved ones. Now that I’m learning Italian, one of my personal goals is to go to an Italian restaurant where the waiters speak Italian and completely order in Italian! I admit it. I have a travel addiction and a pretty lengthy travel to-do list. Travel expands our knowledge our Earth and its people. Travel allows us to exchange cultures and cuisines. Let’s face it, sitting on the couch all day is not what I want to do. I want to fill in the blank map I have with the things I’ve seen and done. Unfortunately, I don’t have the money to readily make the things on my list happen. But, if I stop dreaming of these places, then life would be boring. So, I keep working to make this list happen. Although the items on my list are in no particular order, #1 is the most important to me, and for very good reason. #1 is a visit to my maternal homeland of Poland. You may ask, “is your father’s side of the family’s homeland not important?” But it is. And, I’ve already been. When eight years ago I had an offer to visit Ireland, I jumped at the chance. That’s why there’s not a whole lot on my list regarding Ireland. I’ve been to Killarney, Blarney, and the Ring of Kerry. Now, I need to fulfill my life-long dream of making it to the homeland of my babcia and my dziadzia. We all must know where we come from so that we can realize that we are all connected somewhere in our history and will be connected in our future. 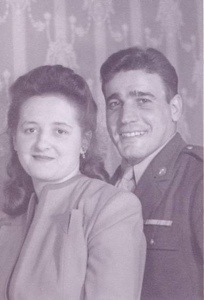 My babcia, Stella Antoinette Wasilowski, and my dziadzia, Edward Frank Wadyko. Both were born in Natrona Heights, Pennsylvania to Polish immigrants.